July 28, 2016—Deep down below us is a tug of war moving at less than the speed of growing fingernails. Keeping your balance is not a concern, but how the movement happens has been debated among geologists. 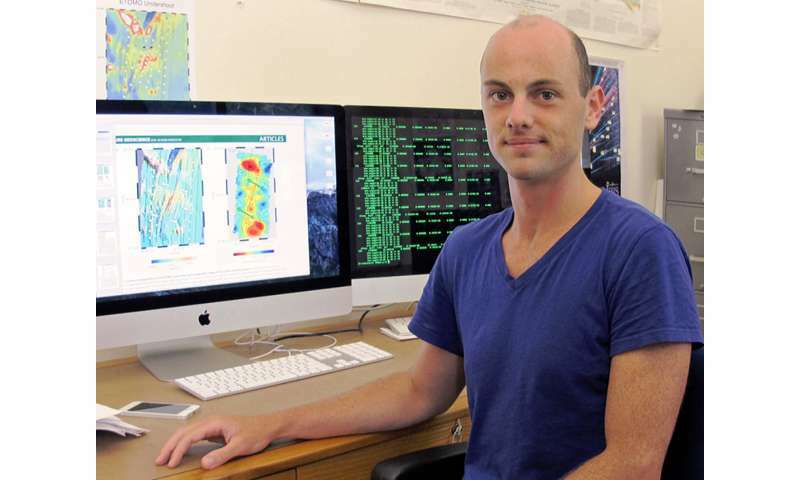 "Comparing seismic measurements of the present mantle flow direction to the recent movements of tectonic plates, we find that the mantle is flowing in a direction that is ahead of recent changes in plate motion," said UO doctoral student Brandon P. VanderBeek, the paper's lead author. "This contradicts the traditional view that plates move the mantle." While the new conclusion is based on a fraction of such sites under the world's oceans, a consistent pattern was present, VanderBeek said. At the three sites, the mantle's flow is rotated clockwise or counterclockwise rather than in the directions of the separating plates. The mantle's flow, the researchers concluded, may be responsible for past and possibly current changes in plate motion. The research—funded through National Science Foundation grants to the two institutions - also explored how the supply of magma varies under mid-ocean ridge volcanoes. The researchers conducted a seismic experiment to see how seismic waves moved through the shallow mantle below the Endeavor segment. "We found the opposite," VanderBeek said. "The biggest volumes of magma that we believe we have found are located beneath the deepest portions of the ridges, at the segment ends. Under the shallow centers, there is much less melt, about half as much, at this particular ridge that we investigated. "Our idea is that the ultimate control on where you have magma beneath these mountain ranges is where you can and cannot take it out," he said. "At the ends, we think, the plate rips apart much more diffusely, so you are not creating pathways for magma to move, build mountains and allow for an eruption."